Summary: Nikki’s life is far from perfect, but at least she has Dee. Her friends tell her that Dee is no good, but Nikki can’t imagine herself without him. He’s hot, he’s dangerous, he has her initials tattooed over his heart, and she loves him more than anything. There’s nothing Nikki wouldn’t do for Dee. Absolutely nothing. So when Dee pulls Nikki into a crime—a crime that ends in murder—Nikki tells herself that it’s all for true love. Nothing can break them apart. Not the police. Not the arrest that lands Nikki in jail. Not even the investigators who want her to testify against him. But what if Dee had motives that Nikki knew nothing about? Nikki’s love for Dee is supposed to be unconditional…but even true love has a limit. And Nikki just might have reached hers. Review: I had read Pure by Terra Elan McVoy and really liked it so I was excited to read Criminal even though I knew it was going to be completely different. I don't normally read books like this, not because I don't like them I just don't find myself drawn to them. But something made me want to pick Criminal up and I am so glad I did. 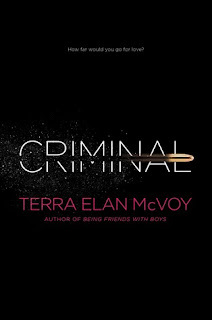 Criminal is really intense as you can probably tell from the summary, but let me tell you I was unprepared for the emotional roller coaster that Terra Elan McVoy put me through. I alternated from wanting to shake Nikki and give her a hug. Nikki was the type of character you would expect, needy and naive. But the reasons McVoy gave for her being like that made a lot of sense. This was a very character driven book and the interactions between Nikki and Dee and Nikki and Bird seemed so realistic it hurt me to think of anyone being in that type of situation. Overall Criminal is a heartbreaking, character driven novel that will have you flipping the pages to find out what happens. If you've read Criminal what did you think? Leave a comment and let me know! Want to win a personalized copy of Criminal? Fill out the form to be entered! Or if you cannot wait and want to buy it now here are some links! Check out the rest of the blog tour! Thanks so much for participating in the tour, giving Nikki a chance, and the great review! It means a lot when smart readers are able to connect with this book. Wow, this book. Spectacularly well-written, taking an unlikable protagonist with an unsympathetic point of view and making her believable and worthy of compassion and understanding--so much so that following her journey to growth and maturity is incredibly rewarding. Masterful, taut writing. Absolutely fantastic.